Anyone recomend a good cheapish scope and mounts combo to go on a air gun? Nikko Sterling Mountmaster. They usually come with 1" dovetail mounts. Yup, ns. Had one on my 97k for ages, before I went with a bigger hawke. Can't go wrong with these,cheap but good. Assuming your rifle is sub 12ft/lb. don't go too mad with range and magnification ,3-9x50 or 4-12x50 is more then adequate for most uses. If you consider that most responsible air rifle hunters reckon on 40-45yds is the sensible maximum distance for taking live quarry then a scope on x9 will bring the target into what seems 5 yds or so actually you wont normally use much more the x6-x7 . As for makes as some of the other lads have said Nikko Stirling is as good as anything out there ,a couple of others at the sensible end of the price range would be Hawke ,Bushnell or MTC. Good luck with it mate. I have a nikko mount master 4-12x50 AO IR, bought it new and from day one the point of impact moves as you turn the magnification ring. Use it for pinking in the garden now. Replaced it with a hawke panorama, but even a hawke vantage I feel would be better than a mount master. I would say you had a faulty one then. I have bought many of them over the years and have never had a problem with them. Yes I did have a faulty one. Just posting my experience with a mount master. Sorry to jump on the back of this post but I have a 50 year old BSA meteor and am looking for some scopes to fit it. I have looked at some scopes on fleebay but some of the advertisers say they fit modern rifles but mine is not. 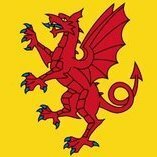 Just looking to shoot a few rats so no distance work, what would you recommend me to buy please. Links to advertisers would be good. I have ordered some scopes, so if they fit I will let you know. Think i would have gone to my local gun shop and had a look what they had second hand. What have you gone for? To be honest for what they have cost me (less than a packet of fags) brand new and foc delivery from China I am not expecting a lot. Being a second focal plane scope the point of impact would move with different magnification settings. Thats why I have a first focal plane scope, on any mag setting the POI is the same. Ive never owned a FFP scope, and Ive never had zero shift on altering magnification. And Ive had a lot of scopes, from cheapo to middle range price. 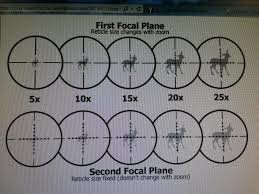 Its what I always thought so if your right, whats the difference between first and second focal plane? Its all about the reticule, this explains it better than words. FFP scopes the reticle gets bigger as you zoom, keeping your ret marks correct. SFP they will only 'work' at a given mag. If you know that (for the sake of argument) your zero is 100 yards, and one mildot will give you 150 yards POI , on the SFP scope , this will only work on the mag you set it up at, you zoom in, and this will alter the POI for that mildot. The issue can be a huge ret at higher mags obstructing view. The other issue of ffp .is that your dots all end up being in random increments making it hard to remember or choose the correct dot . Thats not the way I understand it, Ive never had one so I could be wrong, but if you have say 2 inches of drop between 100 and 150 yards, the single mildot should be in the same place between the 5 x and 20 x view on a FFP scope ? Whereas in the SFP scope , it would be completely wrong. I tend to gauge the amount of drop on the target itself, or if I know the exact range Ill dial it. This is how it should be in my understanding. on a sfp for a 30 yard zero you poi is different on 5 and 10 times mag, yes? 😱 Your point of impact will be the same at 30 yards, if you have a 30 yard zero, whatever scope you use, whatever mag you use. The point of impact obviously changes at different ranges, whatever scope you use and whatever mag you use. Whats different is, if you use mildots or ladder marks, if you dont change the mag they will stay the same, but if you do the target becomes bigger obviously. In the FFP scope the ret and marks/mildots get bigger too, and the POI should keep true. On the SFP scope the reticle stays the same but the target is bigger, making your POI different.